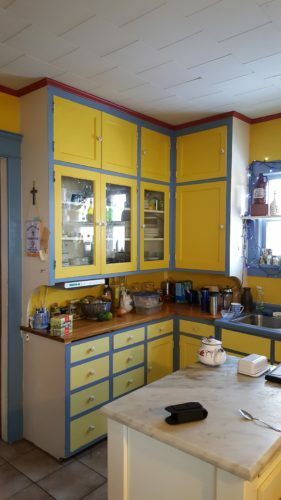 Mostly original, the kitchen in this over 100-year-old house had just worn out. The owners made a valiant effort to work in it as long as possible, but the lack of light, worn out-surfaces, inefficient storage and general layout didn’t serve these people who enjoy cooking. 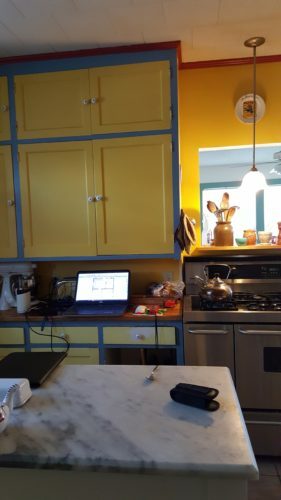 See the photos at the end of this article for the “before.” Kitchen windows were enlarged and a small doorway beside the range was expanded to allow a larger walkway and an eat-at island to be included in the space. 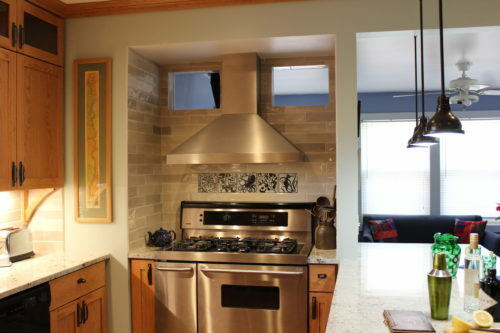 The abundance of sunlight from the adjacent sitting area pours into the kitchen through the enlarged opening and through punched “windows” on either side of the range hood. The large range sits in its own alcove, freeing up the main part of the kitchen for prep, serving and clean-up. The alcove harvested a few square feet from the sitting area, expanding the functionality of the kitchen. Sometimes it only takes a few more square feet, or better-utilized square footage, to completely open up new opportunities. This was just the case. 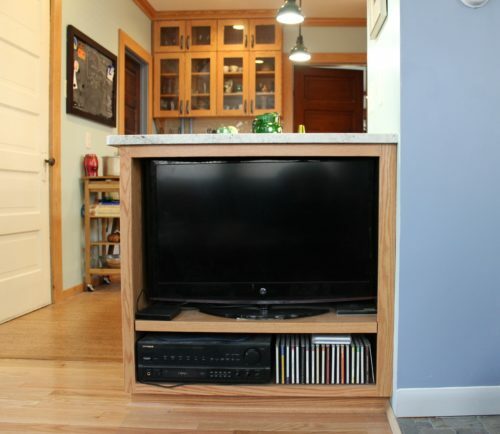 Custom cabinetry throughout allowed the homeowners to make the best use of every nook and cranny. Clever storage accessories allow for maximizing the storage in the cabinets themselves. 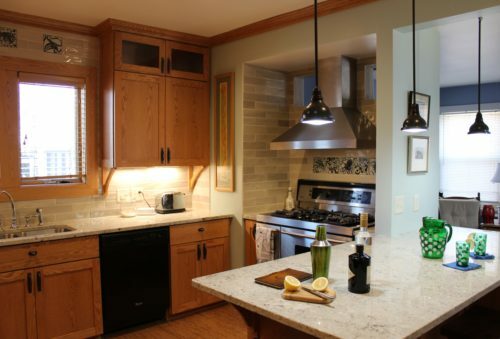 Custom-made brackets under the wall cabinets and island counter hearken to the original kitchen and age of the home. Inspired by the imagery of Greece, the homeowners partnered with a local ceramic artist to make custom tiles for their walls. Each was designed, carved, and fired especially for this project. Classically-inspired and yet innately local, they bring a worldly yet approachable feel to the kitchen, and make the tiled areas of the kitchen a conversation piece. 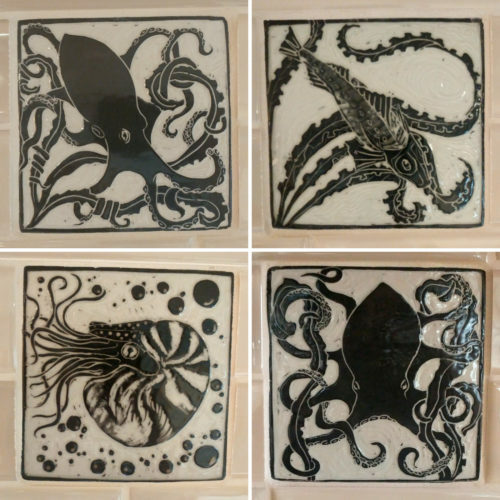 Scattered amongst the commercially-made tile, the variety and artistry of the handmade tile elevates the entire kitchen. 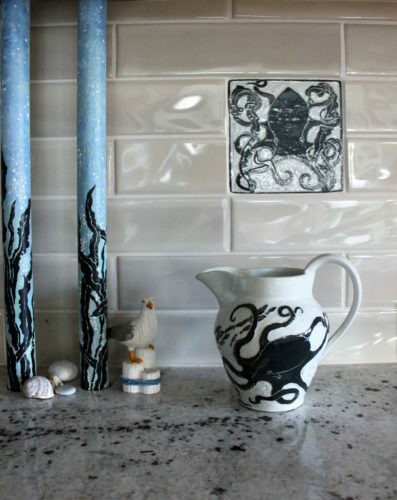 As a solution to the radiator pipes that had to be exposed, the same artist painted them with an underwater scene. It is a charming surprise. The home still uses radiator heat, and a slimmer, modern model was chosen to replace the existing standard one. Custom cabinetry surrounding the radiator allows the heat to flow out through the louvers, and small shelves are built around the radiator itself, perfect for bakeware and other smaller items. The pulls on the cabinet were specifically chosen as a place to hang a damp towel (which will quickly dry in front of the radiator). Granite counters were chosen throughout, and especially over the radiator: it is the place where the avid bakers can proof their bread dough. A custom-built, granite-topped counter is perfect for entertaining–or rolling out pastry. Light pours in from the sunroom, making the kitchen warm, airy, and inviting–rather than cramped and dark, like before. At the end of the island, on the sitting area side, a custom TV cabinet makes casual viewing easy–without the “black hole” effect a big screen can have on a room. 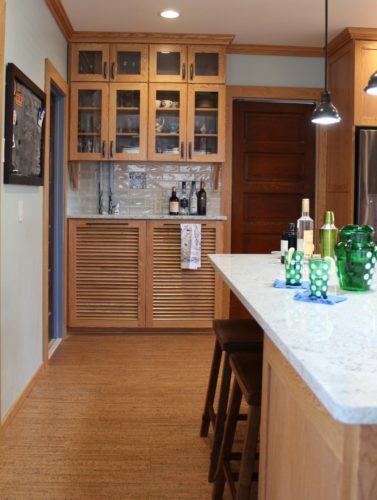 Above the radiator, glass-front doors show off the homeowners’ stemware. Before, the kitchen had random-height and random-depth cabinets that had worn out. Once the cabinetry was out, the walls were opened and additional insulation was added to the exterior walls, eliminating the cold spots in the walls and floors that the homeowners had before. Additional light was one of the big requests for the new kitchen. 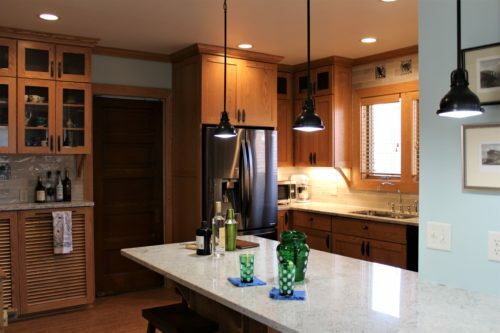 Careful lighting plans allowed for not only additional borrowed light and daylight, but considerably more ceiling light, new island lights and undercabinet lighting. The new kitchen has many more options for how it can be illuminated for working in, entertaining or general functions. 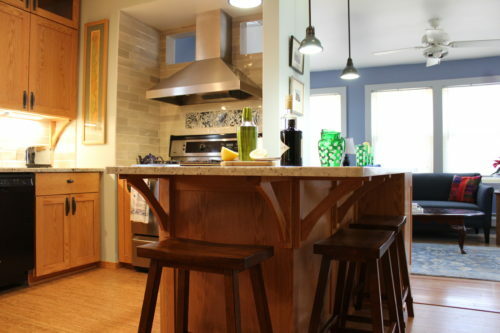 The end result is a kitchen that blends in with the rest of the house, but is a much more usable part of the house as a whole, now that it is better connected to the sitting area, and can be an eat-in kitchen or a place to drink coffee and converse with whomever is cooking. It is also a great place to entertain, allowing people to travel through and around without getting in the way of food prep.